Does eliminating Hitler necessarily make a difference, or would larger structural political forces bring about the same kind of historical outcome? Assuming eliminating Hitler would make a difference, is eliminating Hitler the best way to make that difference? Assuming eliminating Hitler is the best way to make that difference, is it justifiable to treat Hitler as a means to our ends? Would stopping World War II potentially threaten the existence of the people who have been born as a result of the war? Does eliminating Hitler necessarily make a difference? 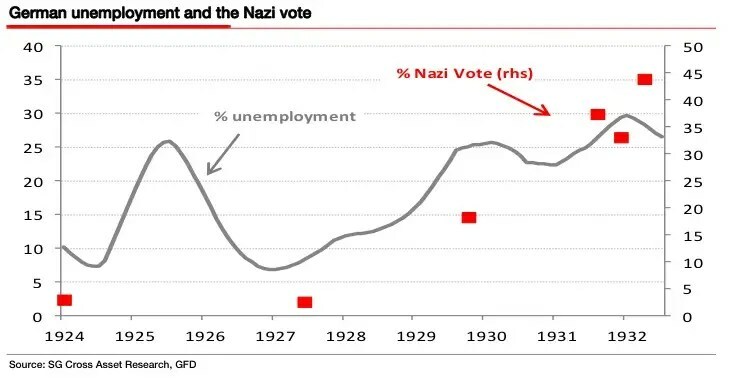 It’s pretty likely that German democracy would have collapsed with or without Hitler and that a subsequent German autocracy would attempt to use its wealth and power to press its military advantages in the region. We should also remember that Germany was not the only axis belligerent–Italy was a fascist state dominated by Mussolini, while Japan was embarking on independent wars of conquest in the Pacific. Things were going to be horrible in the 1930’s and 1940’s with or without Hitler. Perhaps without Hitler the German autocracy might have adopted a more conservative military strategy. But this could produce several different outcomes, depending on how much more conservative the Germans might have been. If they had been so conservative as to not even invade Poland, perhaps war could have been avoided outright. But if they had invaded Poland but opted not to invade the Soviet Union, Germany would not be distracted by a two-front war. This would have made the amphibious invasions of Italy and Normandy far more difficult for the western powers, if not outright impossible. We can imagine a stalemate scenario in which Britain and the US remain independent but unable to break Germany’s hold over western and central Europe, resulting in autocracy prevailing over the nearly the entire continent. We would have German autocracy in the west and in the center, Spanish and Italian autocracy in the south, and Soviet autocracy in the east. Germany might have delayed its confrontation with the Soviet Union until it was more consolidated and better prepared, potentially resulting in bigger, more horrific future wars between German and Soviet autocracies at higher levels of development. So the claim that killing baby Hitler would produce any kind of neat, clean resolution to the problems of the interwar period should be regarded with immense skepticism. But let’s put this all aside so that we can answer the other three questions. Is eliminating Hitler the best way to make any kind of difference? If I am wrong and it is reasonable to think that Hitler himself holds the key to resolving the interwar period, it still seems strange to presume that killing Hitler would be the best way to confront the issue. This theory presumes that Hitler is important because of what he goes on to do, so any course of action that would prevent Hitler from doing what he might otherwise have done would surely be sufficient. The theory requires merely that Hitler be placed on an alternative life path that depoliticizes him. This could be done by kidnapping him and having him raised in some other society that doesn’t have the military potential to embark on wars of conquest. It could be done by helping him get into art school. It could be done by physically disabling him, as there was a strong stigma against disabilities during this period. Even if killing baby Hitler were effective, it could not be the best way to handle the problem. But again, let’s put this aside so that we can answer the other two questions. Assuming killing Hitler were somehow the only way to make any kind of difference, would it be justifiable? The series of assumptions we’re making so that we can even ask this question shows how ridiculous this whole line of inquiry is becoming. If we assume that killing Hitler would somehow prevent a large number of deaths and we assume that there is no alternative way to prevent these deaths, then yes, it follows that we could justifiably kill baby Hitler. Some Kantian moral philosophers would accuse us of treating Hitler as a means to our ends, but I argue with Derek Parfit that it is okay to treat other people as a means as long as we take their moral value into consideration. In this way, though we might be treating people as a means, we are not treating them merely as a means. We are recognizing their moral value even as we determine that in this situation, that value is outweighed. To refuse to kill Hitler in this kind of situation would be to disregard the moral value of the millions of people Hitler played a role in killing–it would make those people a means to our own moral self-gratification. Sometimes in morality the choice is not whether or not to treat someone as a means, but about which people to treat as a means, and to what end. But even in this case with these bizarre assumptions, there is one more matter we should consider. Would stopping World War II potentially threaten our own existence? We should also remember that in the decades that followed, these boomers also had their children, and they also changed the lives of many other people. The 1960’s were a time of social upheaval and meaningful political change in the US in part because of the large number of young boomers who became politically active during that time. The people who are alive today are alive not in spite of Hitler and World War II, but largely because of it. The lives they lead have been immensely shaped by that conflict–many modern technologies have their roots in war technology, including commercial airlines, the internet, nuclear power, the space program, and so on. Without Hitler and without the war, different people would live here today living different lives that might be completely unrecognizable to us. Hitler and his wars are deeply woven into the very fabric of our societies. If we lived in the 1930’s or the 1940’s, we would have no way of knowing what the future would look like. We wouldn’t know which people were going to exist in the future, and we might plausibly assume that the future would be a better place for whoever might live in it without Hitler. We couldn’t have duties to any particular set of future people. We might have had an abstract duty to the future more generally, but we definitely would have had concrete duties to the people who were alive during the 30’s and 40’s, and we ought to have done whatever we could to minimize the suffering they were enduring, both at the hands of the depression and later at the hands of the war. But we are not people living in the 30’s or 40’s. As people living in a post-Hitler world, attempting to go back in time to stop Hitler is synonymous with destroying the society we have built in his wake. It would cause already existing people to cease to exist, and would essentially constitute a genocide of the present for the benefit of the past. For these reasons, if someone were to try to build a time machine for the purpose of going back and stopping Hitler, the rest of us living in the present might be justified not merely in declining to endorse that project but in actively trying to sabotage it. Jeb Bush didn’t get into all of this, probably because it’s an absurd hypothetical scenario with little bearing on contemporary politics. Nevertheless, I find it a bit disturbing that he answered the question with so much confidence. There is a lot going on here, and a presidential candidate ought to be able to use a question like that to demonstrate an understanding of history. Instead, Bush tried to use it to show that he’s tough and decisive and doesn’t spend too much time thinking about things. There was another guy named Bush not too long ago who was the same way. It did not work out so well. Hey. You have a great blog and this is a great post. I am new to blogging and I just wanted to know how long does it take for you to write a post like this? Thanks–most of my posts are written in a couple hours. Benjamin, Yours is a great answer to a very stupid question. Reminds me of Ray Bradbury’s famous short story, A Sound of Thunder. What I’d like to know is, if you had a chance to strangle Huffington Post in its crib, would you do it? Very good answer. I fear Jeb, and fellow sympathizers, would spend an awful lot of time traveling back and forth to inflict euthanasia on present day villains – their name changing every time he returned to find his efforts were in vain! Me as a german history student really enjoyed reading your post- great job! By reading your text I noticed that you mixed up number of democracies and percentage from figure 1. I don’t see the error, Clemens. Could you explain it a bit further to me?